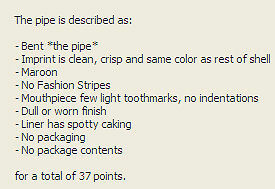 The value of pipe #067 is 37 points. John Herman was offering this pipe on an eBay auction. He had another the pipe (which is now listed on the Pipes for Sale page) and a Kaywoodie in the lot. I gave the Kaywoodie to Baker Egerton as a "thank you" for keeping me up to speed on these auctions. When I got a better example of this shape/color this one went to the Pipes for Trade page. Larry Arnold found it while browsing this site and decided it would fit his collection well.